How do you like your Bruch? Sweet and sentimental or more down-to-earth? When I grew up Swedish Radio�s only channel had a programme late every Christmas Eve, �Santa Claus in the Gramophone Archive�. A recurring piece of music was the Adagio movement from Bruch�s first violin concerto. As far as I remember it was always very sweet, very sentimental. I have no recollection of who was the player, if it was the same recording every year. Anyway, when I got old enough to buy my own record player one of the first LPs was Wolfgang Schneiderhan playing the traditional coupling of Mendelssohn and Bruch. This has ever since been my benchmark version of both works. Unfortunately the record is now so scratched that it is unplayable so I couldn�t compare the present disc with the old master. My memory tells me, however, that Schneiderhan, without being sentimental had more sweetness of tone and a more even, less obtrusive, vibrato than Maxim Fedotov. Schneiderhan was more classically balanced while Fedotov is more down-to-earth. He plays with an incandescence that is refreshing and made at least this reviewer listen with renewed interest. And there is corresponding bite in the orchestra, Yablonsky and Fedotov obviously being of one mind as to how this music should be performed. The celebrated Adagio gets its fair share of sweetness, or rather inwardness. It is in fact rather subdued which actually makes it even more beautiful. This is a fully valid version of the oft-recorded concerto and at budget price no one wanting this music need feel short-changed. Even well stocked collectors may feel tempted by this issue, due to the two �fillers�, which are rarely heard and rarely recorded. Salvatore Accardo recorded everything by Bruch decades ago. I don�t believe they are available at present. While the first violin concerto � he wrote three � is a work from his relative youth, the two-movement Konzertst�ck was written late in life when he was past 70. 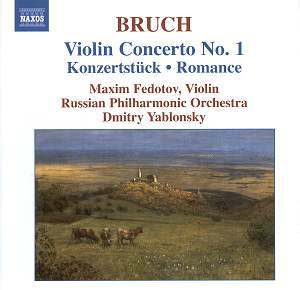 It is a beautiful, well crafted piece and even if it lacks the youthful freshness of the concerto it still has many of the same characteristics, Bruch not being one to change his musical language during his long career. This is music that needs a whole-hearted advocate and Fedotov lavishes all his energy and intensity as he does in the Romance. This was originally intended as the first movement of his second concerto but in the last resort he decided to publish it as a separate work. Initially somewhat darker than the concerto it soon turns out to be a grateful vehicle for technical wizardry, but as with so much of Bruch�s music it is the cantabile character that stays in the memory. Neither of these two works are barn-storming �finds� but they are agreeable and attractive. I derived a lot of pleasure from the whole disc. Playing time is not over-generous but the price is attractive, Keith Anderson contributes one of his splendid essays and the recorded sound is all one could wish.